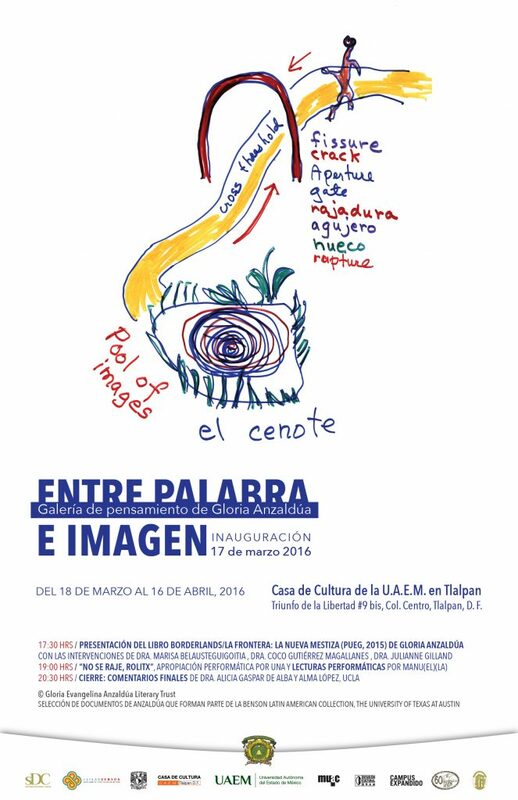 will take place at the MUAC. An image is a bridge between evoked emotion and conscious knowledge; words are the cables that hold up the bridge. Images are more direct, more immediate than words, and closer to the unconscious. Picture language precedes thinking in words; the metaphorical mind precedes analytical consciousness. When I studied painting and writing, I discovered that I could create concrete universes. Rather, I didn’t create them; I was the conductor for them, the channel. BETWEEN WORD AND IMAGE. A Gloria Anzaldúa Thought Gallery, exhibited for the first time in the south of the Río Bravo, confronts us inevitably and creatively with the following questions: How do we read and take up the visual and textual work of Anzaldúa today, here in Mexico? What role do borders play? Borders, we inhabit, we survive and where we live. How does Anzaldúa help us give tongue/language and sense to the ways in which race relations, gender, sexuality, ethnicity and class are configured in Mexico and the Borderlands? What is she saying/showing to us? How current/relevant are her thought and intellectual propositions? A self-described “Chicana, tejana, working-class, dyke-feminist poet, writer-theorist,” Gloria Anzaldúa also saw herself as a nepantlera, one who navigates a liminal space between worlds, identities, and ways of knowing. Just as fluid movement between English, Spanish and Nahuatl was central to Anzaldúa’s teaching and writing, so too was the interplay between words and images an essential element of her self-expression. 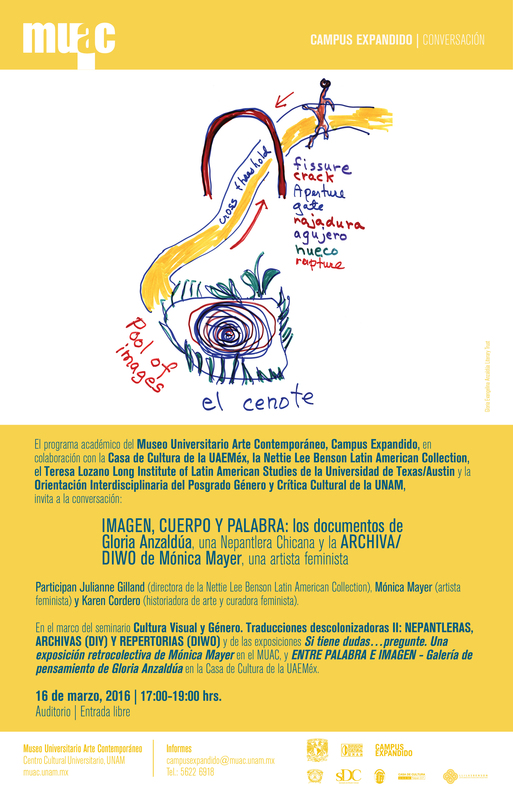 The words and images presented for the first time in Mexico come from transparency drawings, notes, and diagrams that Anzaldúa presented to her audiences at workshops and lecture “gigs” across the United States of America. Some are undated, but many were created during one of the most active periods of her teaching career, in the mid-1990s. Translations: Coco Gutiérrez-Magallanes, Nina Hoechtl, Valerie Leibold, Rían Lozano, Mauricio Patrón. Convened by Casa de Cultura de la UAEMéx, Campus Expandido/MUAC, LLILAS Benson Latin American Studies and Collections, Universidad de Texas/Austin, Tepetongo. Balneario Crítico y Centro Cultural Border.